A while back I promised in the comments that I’d try to explain how I paint Space Wolves. Being me, I then got painter’s block (if there’s such a thing) regarding anything blue-grey! Anyway, better late than never, I guess. I’m breaking this up into two posts partly because it’s got a bit too long and partly because my camera seems to be on its way out and I’ve tried and failed to take the final set of pictures twice already in bright sunshine and with flash and every time they’ve come out far too dark. So by splitting the post up I have a chance to see if I can get a better result with my boyfriend’s camera! 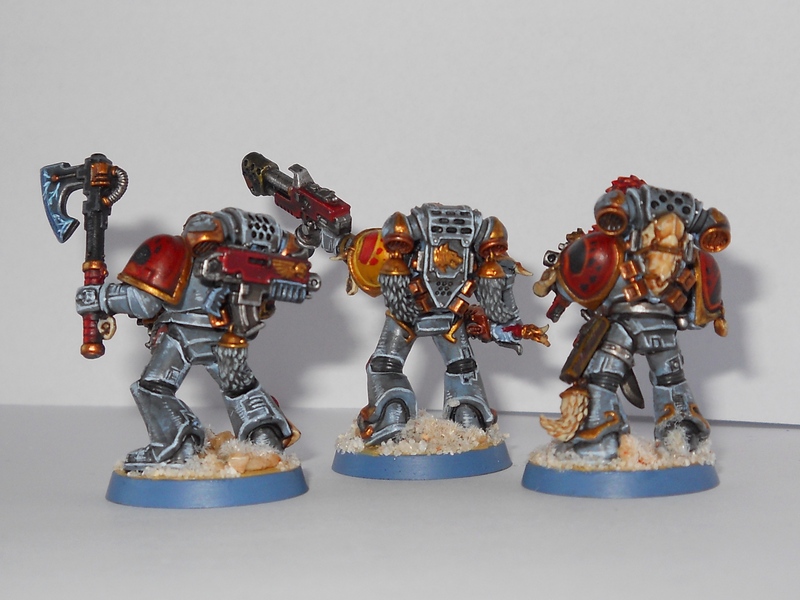 In this post I’ll go over what paints I use and a few of the tricks and in the next post I’ll go through how I paint the Space Wolves themselves. I’m in the process of swapping across to the new Citadel paints, so in some cases I’m using old paints. Some of the new paints are not identical to the paints they replace (I’m still mourning the loss of Mechrite Red) so I’d check colours before you start. Games Workshop have a conversion chart available as a PDF on their website. Where I’ve used the old Citadel Paints I’ve put the new name in brackets in the paint list below (and yes, I use far too many!). 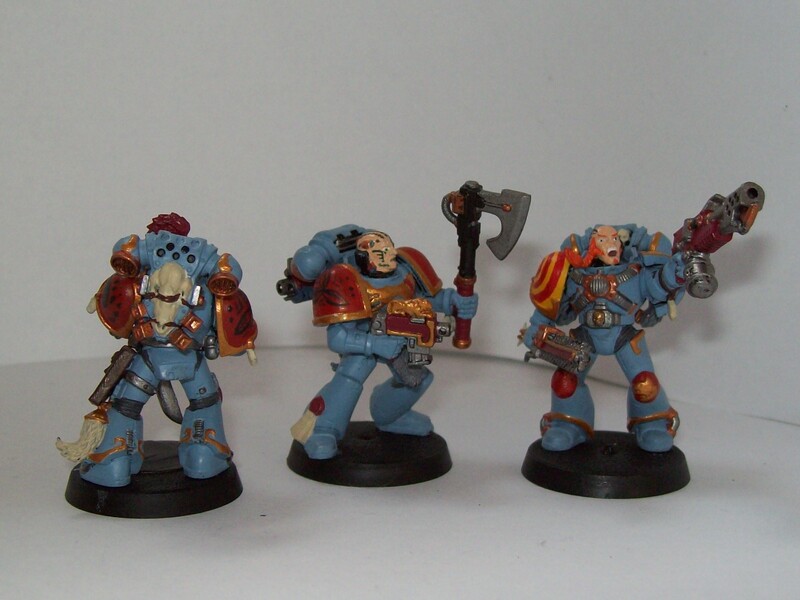 That said, this is how I paint Space Wolves, it’s not like there are any hard and fast rules, if anything this is intended to be a guide to creating your own paint scheme. I also mix some of my own paints. To save time, I’ve given these mixed paints names in the paint key. I like to mix paints to get the particular colour that I want or build up highlights. For small quantities I mix paints directly on my palette, but for larger quantities I make up my own pots. I save my empty paint pots and use a syringe to measure out paint in the right ratio. I then make sure the lid is tightly closed and then skip round the house shaking the pot in order to mix them together. I use line highlights a lot. My Space Wolves are probably not the best example on how to use them as they were originally started before I knew what line highlights actually were, so I have had to rein back my enthusiasm to try and keep the army vaguely consistent. In general to line highlight, I start, after washing, with the original colour (Citadel shades and the old washes do change the base colour slightly), then I work through a series of colours starting with a 50:50 blend of the base colour and next lightest paint, followed by that paint. For more extreme highlights I then mix that colour with a lighter shade etc. 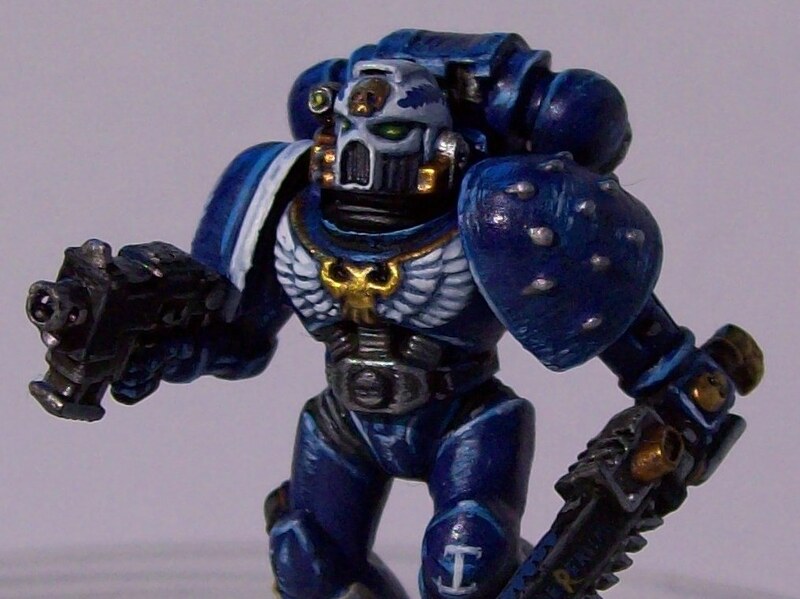 So, for instance with the Ultramarine here I started with Macragge Blue and washed him with Drakenhof Nightshade. I then line highlighted fairly heavily with Alaitoc Blue and put lines of colour where it looked like more light would fall on the model. For instance on the shoulder pad I added areas of lighter colour on the top and centre. 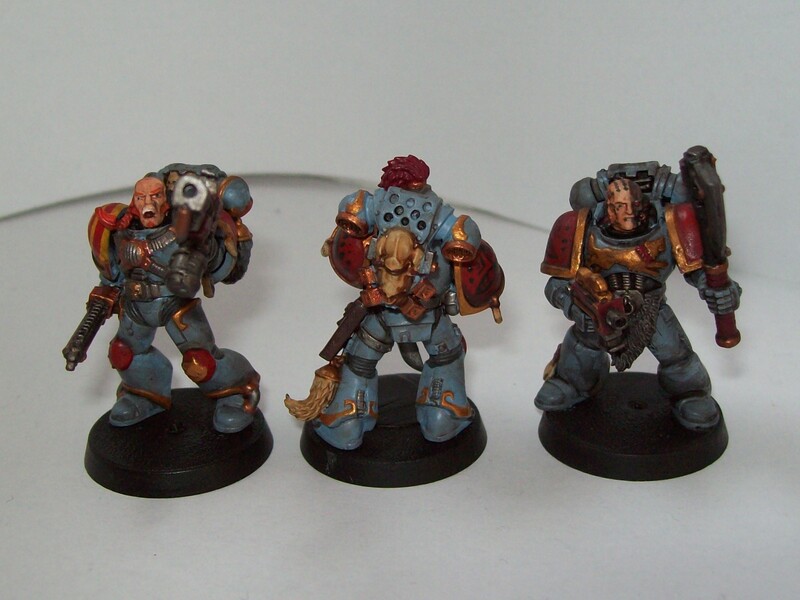 I then highlighted again with Ice Blue on more prominent areas and then used Space Wolves Grey for extreme highlights such as on the very edges of the shoulder pad. For the Ranger’s coat I used Caliban Green as the base colour. 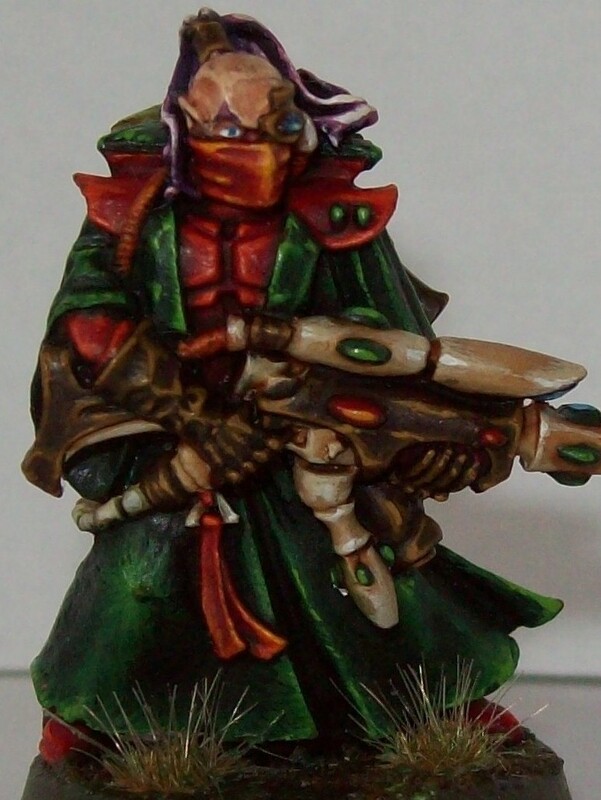 I then washed it with Biel-Tan Green before highlighting it first with Caliban Green, then with a 1:1 blend of Caliban Green and Warpstone Glow, followed by Warpstone Glow and finally extreme highlights of Scorpion Green (Moot Green). I followed the folds of the cloak, starting with very broad strokes, reducing the thickness as I changed colour. For me, highlighting does two things. It defines edges, such as those on the Ultramarine’s armour, and adds to the “3D-ness” of the figure by defining upper surfaces caught by light and contrasting with shadier areas such as on the Ranger’s coat. I don’t always undercoat, the blue-grey colour I use is fine on black as are the silvery metallics. I do undercoat for reds, yellows, brasses/golds and creams/whites as these colours sometimes require multiple coats in order to get an even colour, a base coat reduces the number of layers needed and helps give a flatter colour. I’m currently using a Chaos Black undercoat on all my models. Right, so those are the basics. 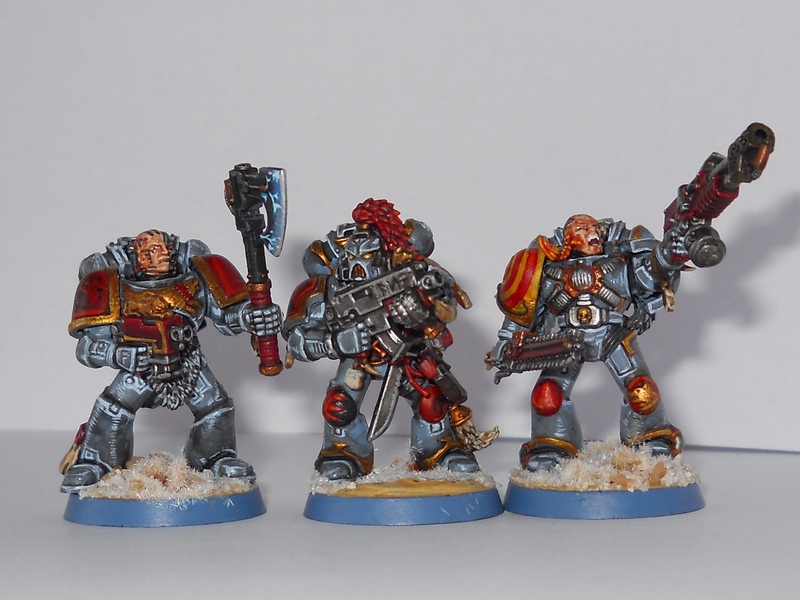 Part 2, where I actually show some Space Wolves, will be up as soon as possible! Sorry for the long wait!